AutoDiscovery is an intelligent high-throughput automated exploratory data analysis (EDA) software that helps scientists at better understanding the underlying complexity of biological processes such as cancer development, diabetes, mental diseases, etc. To do that, AutoDiscovery unveils complex structural relationships hidden in the data files of scientific experiments and clinical studies. 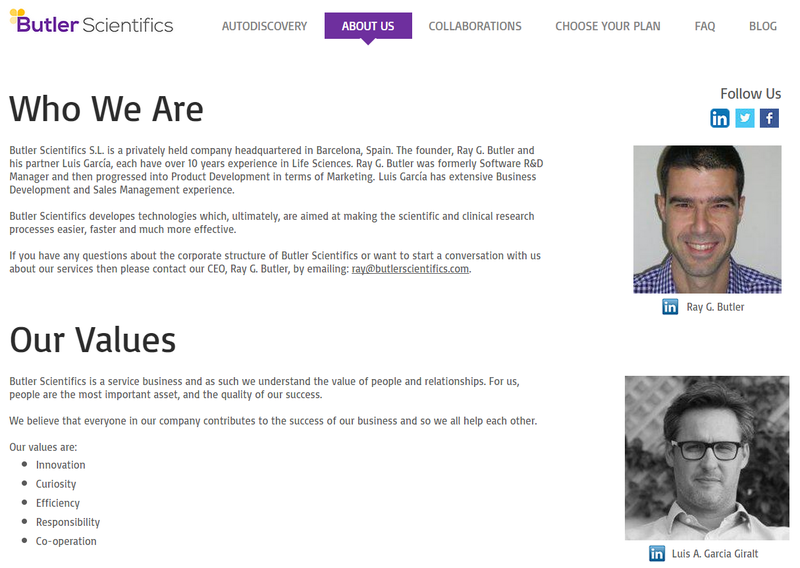 Butler Scientifics is a bioinformatics startup headquartered in Barcelona, Spain. Our mission is to develop, improve and supply software services and information systems in general to optimize the workflow of scientific research teams and future researchers worldwide to accelerate obtaining new relevant knowledge. Squeeze the knowledge out of your complex dataset: Unveil the most promising relationships that may explain better the complex behavior of the variables in your study. Go for data-driven optimization: Identify efficiently the particular conditions in which your research, clinical and business procedures show an optimal response. Uncover and predict trends: Take advantage of your mined knowledge to get effective predictions on how the variables will behave in any given condition. AutoDiscovery is designed for researchers at public or private labs working in basic or applied research projects which combine both quantitative and qualitative information, especially clinic, experimental and observational research. The main scientific areas of application are those related to Life Sciences and Social Sciences especially (but not limited to) Medicine, Genetics/Genomics, Biology, Chemicals, Immunology, Toxicology, Pharmacology, Neuroscience and Psychology. Software development API / component (OEM). Butler Scientifics S.L. is a privately held company headquartered in Barcelona, Spain. The founder, Ray G. Butler and his partner Luis García, each have over 10 years experience in Life Sciences. Ray G. Butler is the CEO and Software R&D Manager. Luis García is the Business Development and Sales Manager. The main access point is the plan selection section of our website.